With summer just around the corner, what’s the geekiest way to keep cool? It could just be the Solar Hat Fan. The eco-friendly gadget does exactly what it says on the tin: keeps you cool, by sourcing the juice to run its fan blades directly from the sun’s warming glow. 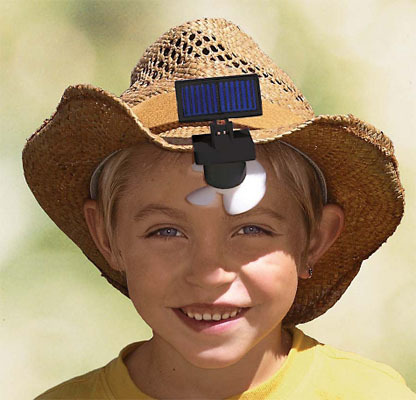 Simply clamp the Solar Hat Fan onto the front of your bonnet, sombrero, fedora or stetson and you’re free to roam the streets, your face kept comfortable by cool air.